2018 release. 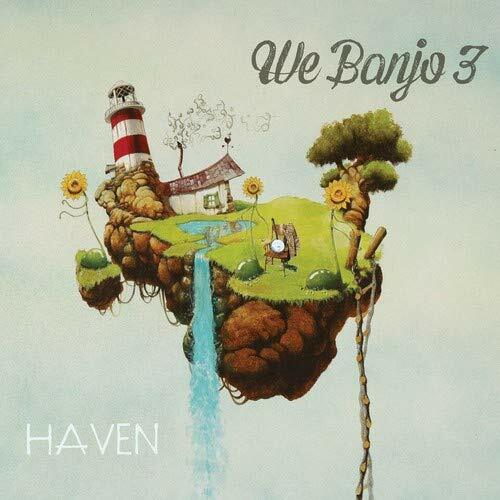 We Banjo 3, an award-winning band from Galway, Ireland, release their fourth studio recording, Haven. Featuring banjo, fiddle, mandolin, guitar, percussion and vocals, We Banjo 3's sound is an infectious blend of traditional Irish Music with Americana, bluegrass, and a hint of pop, affectionately described as Celtgrass. We Banjo 3 comprises two sets of brothers, Enda & Fergal Scahill and Martin & David Howley, who are among the most celebrated and distinguished musicians to come out of Ireland in recent years. Martin Howley is a 7-time "All Ireland" banjo and mandolin champion. Enda Scahill, an author on Irish banjo techniques, holds 4 "All Ireland" titles. Multi-instrumentalist Fergal Scahill is one of the most acclaimed fiddlers in Irish music, with a growing international reputation, and "All Ireland" titles on fiddle and bodhran. David Howley, with "All-Ireland" titles on guitar and banjo, is the group's vocalist and guitarist known for his showmanship and deeply emotive vocals. If you have any questions about this product by We Banjo 3, contact us by completing and submitting the form below. If you are looking for a specif part number, please include it with your message.